← Empty USB Memory Stick: Style Over Substance? Information security has never been as important as it is now with office firewalls and desktop passwords no longer enough to ensure the safety and security of vital information. IT specialists need to ensure that sensitive information is kept secure, but at the same time, it should still be easy for authorized personnel to access the necessary files. Apricorn takes information security to a whole new level with the release of the new desktop edition of its Aegis Padlock, a high capacity external hard drive designed specifically for desktop systems that demand strict security. The Aegis Padlock USB 3.0 hard drive is perfect for use in the corporate environment. All companies keep sensitive information—customer information, financial records, proprietary company data—and thus, the safekeeping of data is a must. The Aegis hard drive protects data and information through hardware encryption and secure PIN access. 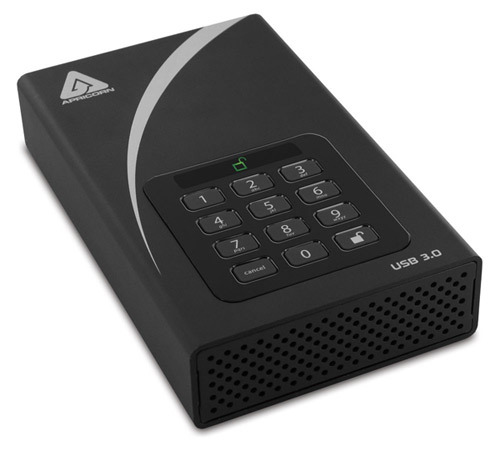 Data stored on the drive is protected with either AES-XTS 128-bit or 256-bit hardware encryption. The Aegis Padlock drive can be unlocked with a unique 6-16 digit PIN using an onboard keypad which is “wear-resistant” in order to hide key usage so as not to give any clue to potential, unauthorized PIN guessers. Encryption keys and PINs remain secure thanks to a SHA-256 hashing cryptographic algorithm. Meanwhile, its solid aluminum enclosure is ideal for driving away heat from the rotating drive inside. The hard drive has multiple storage capacities of 1, 2 and 3 TB and features Super Speed USB 3.0, the third generation of USB technology that has 10 times faster data transfer rates than the previous USB generation. However, rest assured, the Aegis Padlock USB 3.0 hard drive is backward compatible for versatility. Plus, it has a software-free design and can run on any platform – making it easy to use with operating systems including Windows, Mac, and Linux. The Aegis Padlock is definitely a complete data storage solution that can meet the security, storage, and ease-of-access demands of offices and companies. Prices of the security hard drive range from $229 to $369 depending on storage capacity and encryption model. Do you think the Aegis Padlock is enough to protect your business? Don’t forget to weigh in below. This entry was posted in Aegis Padlock, Articles, External Hard Drive, SuperSpeed USB 3.0, USB 3.0, USB 3.0 Hard Drives, USB Devices, USB Storage Drives, USB Technology and tagged Aegis hard drive, Aegis Padlock, Aegis Padlock drive, Aegis Padlock hard drive, Aegis Padlock USB 3.0 Hard Drive, Apricorn Aegis Padlock, Apricorn Aegis Padlock USB 3.0 Hard Drive. Bookmark the permalink.